Water Treatment: Neutralizes 99.99% of bacteria and viruses when used with suitable pre-filtration. 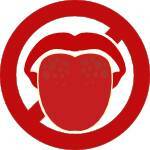 Suitable for use in homes, offices, factories, restaurants. The UV FLOW 55-3, used in conjunction with suitable pre-filtration, will disinfect drinking water. It's single 55 Watt germicidal UV lamp will be effective for a flow rate of up to 50 liters per minute at a water pressure of 400 kPa. The unit is has an Inlet and Outlet of 1" (25mm) so it can be connected in-line. 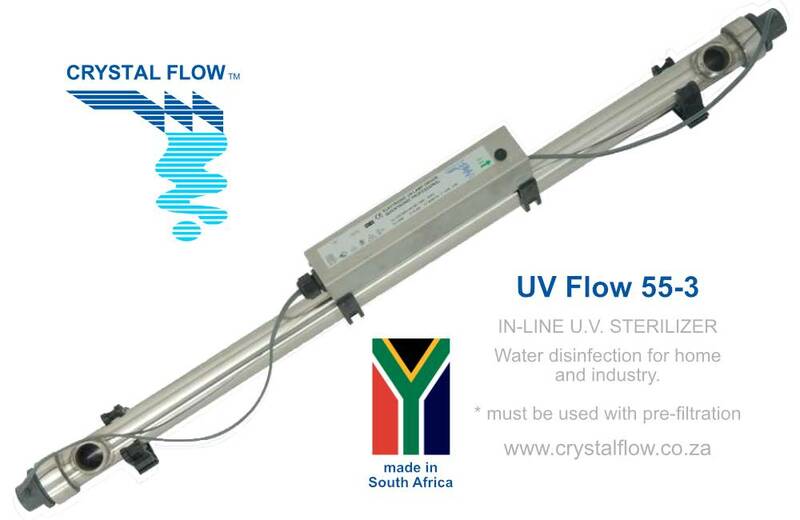 The stand-alone UV disinfection systems are only effective when used in conjunction withsuitable pre‐filtration. The systems are wholly manufactured in South Africa. 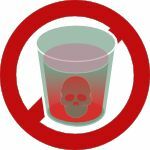 Ultraviolet light is commonly used for water disinfection by the food, beverage, dairy and brewing industries and by private consumers to ensure their water is safe to drink. The treatment chambers are Food & Beverage grade stainless steel for cleanliness and long life. The UV FLOW sterilizer is designed to provide many years of reliable operation at an economical price. The UV FLOW is suitable for domestic water and food industry use when used in conjunction with other water treatment systems.UV light is lethal to most micro-organisms as it inhibits their ability to reproduce. The UV FLOW Ultra Violet water disinfection system is an effective and economical means of neutralizing harmful bacteria in drinking water supplies. The UV FLOW unit is designed for continuous operation treating cold water (up to 45°C) at any flow rate up to the design flow rate. 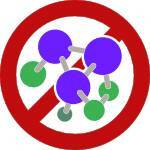 Extended periods of zero flow are not harmful as long as the treatment chamber is full of water. Allow 2 minutes warm up from switching on before starting flow. Allow 24 hours operation for a new lamp to develop full output. The UV lamp is double ended for ease of servicing and connection. Disassembly is quick and user friendly with positive sealing at both ends. The power supply must be mounted in a dry location. 1 metre of lead to the lamp is provided. Installation can be horizontal or vertical and piping should be arranged so that the unit stays full of water. If horizontal, the inlet and outlet should point upwards, if vertical the inlet should be at the bottom. Mounting brackets are provided for easy installation. All units are supplied with full installation and operating instructions to ensure proper usage and assist with long term maintenance. We recommend pre-filtration. This ensures that particulate matter does not shield micro-organisms from the ultraviolet light. Depth sand filtration or cartridge filtration is the usual minimum. In some cases, particularly with surface water, finer filtration may be necessary. If cysts like Giardia or Cryptosporidium may be present 1 micron filtration is required. WARNING: UV light is harmful to eyes and exposed skin. NEVER EXPOSE YOURSELF TO UV LIGHT WHEN THE LAMP IS SWITCHED ON. ** For homes, factories, restaurants, schools, hotels, corporate offices and other installations with water sanitation needs. 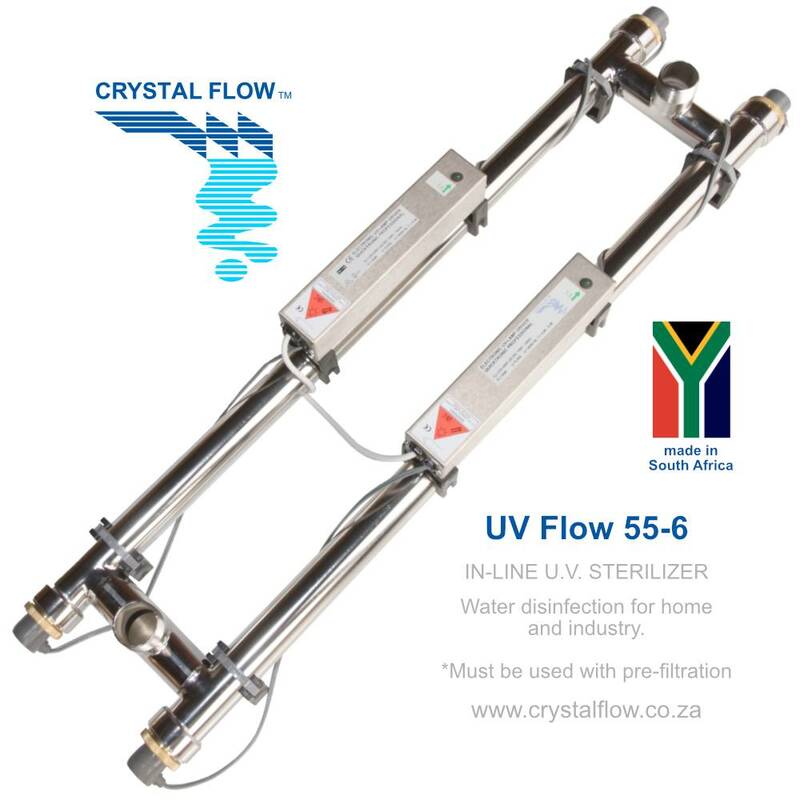 The UV FLOW 55-6, used in conjunction with suitable pre-filtration, will disinfect drinking water. It's two 55 Watt germicidal UV lamps are effective for a flow rate of up to 100 liters per minute at a water pressure of 400 kPa. The unit has an Inlet and Outlet of 1¼" (32mm) so it can be connected in-line.